The late Tony Lawless achieved athletic greatness in two Illinois cities -- Peoria and Chicago. As a multi-sport standout athlete at Spalding High School he played a key role as the Irish won the 1924 National Catholic High School basketball tournament, a team enshrined in the Greater Peoria Sports Hall of Fame. From there he went to a standout football and basketball career at Chicago Loyola, where he was named All-Midwest as a fullback and captained the basketball team. He went on to an unprecedented coaching career at Fenwick High School in Chicago. In 47 years at Fenwick he became a true legend. Hired over 250 other applicants for the brand new Chicago school that opened in 1929, he would be athletic director for his entire career while coaching football, basketball, swimming, golf, tennis and track. He was best known as a molder of great football teams. Fenwick went 177-43-8 with him at the helm and and amazing 142-17 in the rugged Chicago Catholic League. He coached many all staters including Notre Dame all American and Heisman Trophy winner Johnny Lattner. 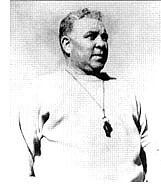 When he gave up coaching to become athletic director in 1947, he never had a team lose more than two games in a season. He won five Catholic League football titles, the 1935 Catholic State basketball crown and the 1937 National Catholic basketball tournament. Lawless also organized the Chicago Catholic League Coaches Association and the Chicago Catholic League Hall of Fame. He is a member of the Illinois Football and Illinois Basketball Coaches Halls of Fame.